This post is in a way an update of this post, but with a different focus and hopefully a bit more structured approach. The post is timely, in that the interim budget negotiations are about to start and various politicians have started marking their positions. I apologize that most links are in Finnish only. 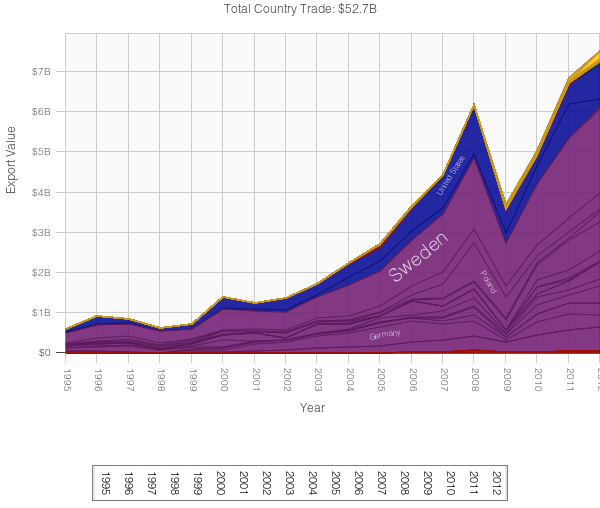 Also Sweden has suffered more [from the crisis] than OECD countries on average, although less than Finland. This is in itself already sufficient reason to doubt the claim that Finland has big structural problems regarding the labour supply, that Sweden is claimed to have solved. This claim is especially suspicious because the decline of potential production was timed in all countries at the start of the financial crises, which everywhere led to a decline of private and unfortunately also almost everywhere of public demand. How can this be, if Finland has some particular structural problem? And even though the crisis might have revealed some particular structural problem of the Finnish economy – as has been claimed – without the crisis it wouldn’t have been noticed, so…?? The current economic debate in Finland is thus clearly ideological (as it is almost anywhere). This being said, the state of the Finnish economy is quite horrid. First I show the development of GDP since 2000 (figure source: Tilastokeskus). 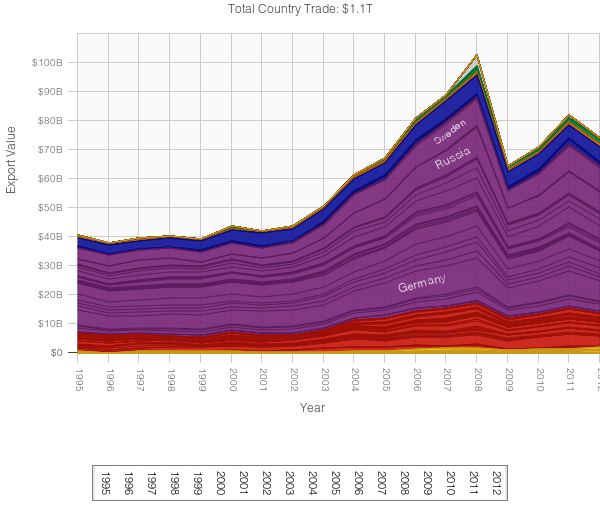 It shows both the old and new methodologies of counting GDP. Obvi0usly, in this figure nothing like a recovery can be observed. With the ongoing structural changes in the Finnish forest industries and the implosion of Nokia it is not quite likely that this trend is coming down soon. The Finnish ministry of Employment and the Economy has its own methodologies and statistics, and focuses on people who actually look for work. The picture can’t be copied here but I suggest to take a look. Line (1) shows unemployed people looking for work and line (2) shows the number of open positions (through mediation of the Employment Office). In my view, this is a quite depressing figure. This graph shows that at least using this measure domestic demand is perhaps slowly decling or has been at most flat since 2011. This may be somewhat explained by the Finnish system of unemployment benefits – the labour unions manage the unemployment funds, and union members get up to 500 days a certain percentage of their last salary. Thus, unemployment does not immediately mean a crisis in household expenditures. 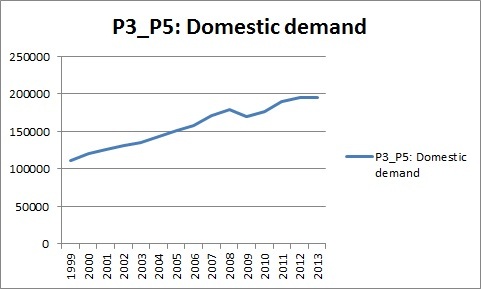 But on the other hand, under current circumstances it is not likely that domestic demand would soon increase. Most likely the growth of domestic demand from 2009 to 2011 was due to availability of credit at low interest rates. This may be reflected in increases in private indebtedness as well (see below). 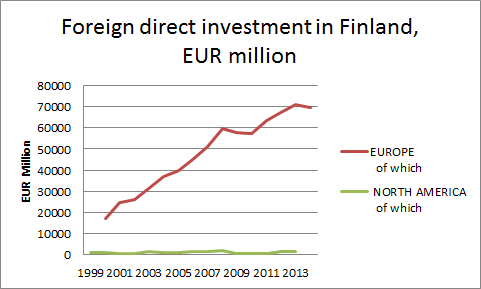 From this graph it would seem that Finland has only recently become less interesting as a country to invest. 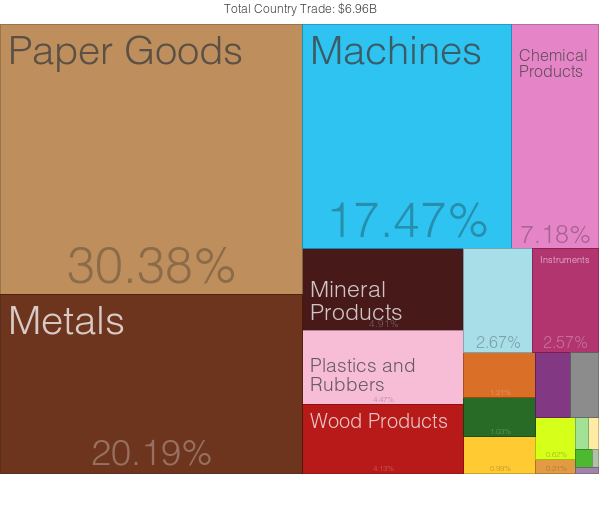 By far most FDI comes from Europe, with Sweden and the Netherlands the biggest investors from Europe. Investment is needed to create new jobs, so this would seem to be a fairly positive situation, as Finland has a highly educated workforce, good infrastructure etc. So, on these macro-level variables, Finland is not doing very well in terms of GDP and Unemployment but FDI and domestic demand seem to hold up fairly well. 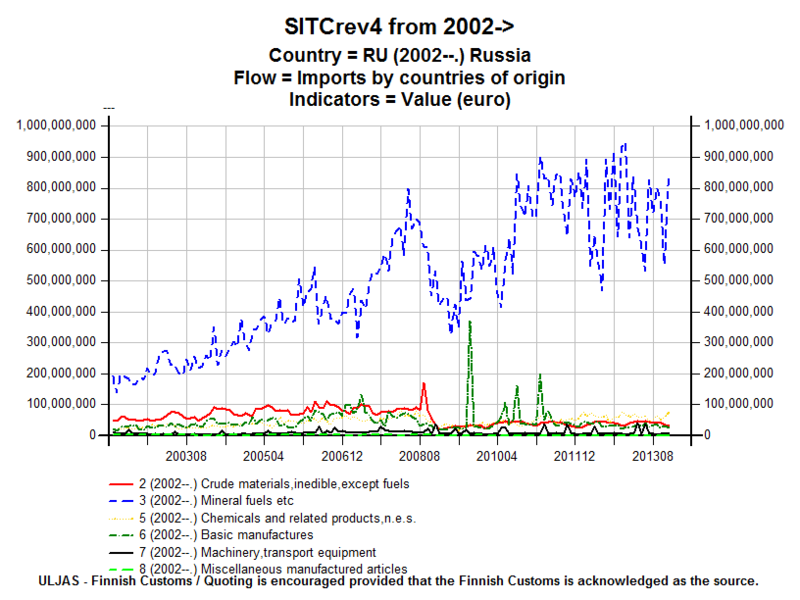 The big question is of course, how the Russian sanctions and possible counter-sanctions are going to affect the Finnish economy. 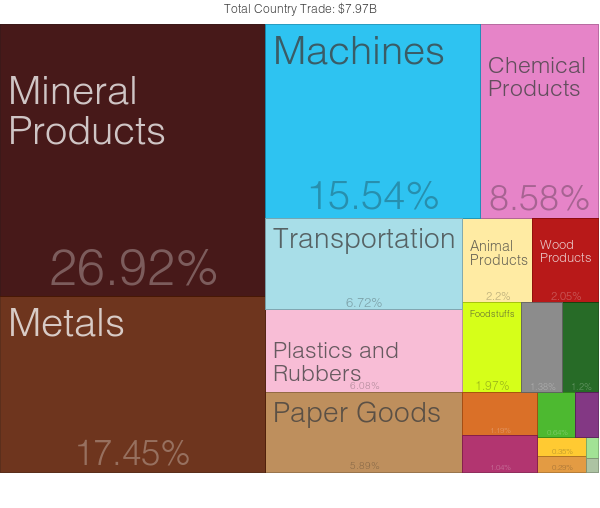 In the post that I referred to above it can be read that the trade balance of Finland is well, nearly in balance. This is perhaps a function of increasing imports and declining exports – after all, the whole labour market debate is centered around the primacy of Finland as an export-oriented economy. Here we can see that consumption credit has expanded somewhat, but the main driver of Finnish private indebtedness is the mortgage. 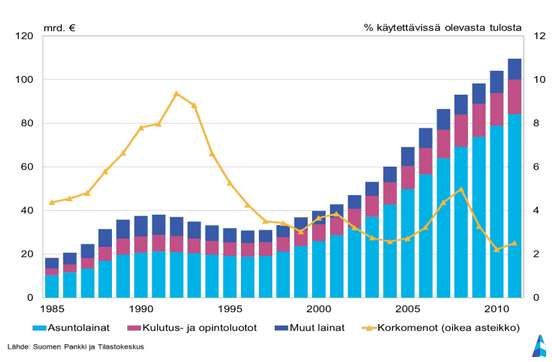 Elsewhere I have argued (in Finnish) that it is possible that Finland has seen a real estate bubble, which by now has burst – there are many indications for this, as in the country side prices are declining rapidly and houses stand for sale quite long. Another indicator is that even though housing prices are down, rents are up, which may be a way of recuperating (future) losses. Either way, Finland’s household sector debt is quite high and their financial assets are seen to be contracting. This is not yet a problem, but with rising unemployment and declining housing prices it could become a problem, since if you are unemployed somewhere and are unable to sell your house, you are literally stuck because it is often necessary to move near a job. And since the places with Nokia -related industry are not doing well, this is likely to become a problem. On the other hand, public debt is still relatively modest. The expectation is that it will cross the 60% -limit next year but it is still nothing to panic about. Private sector debt is high, but this is not necessarily a problem either. The problem is that Finnish companies are faced with reduced aggregate demand and therefore don’t invest, or worse make many people redundant. This realization means that the current trend in labour market relations, extreme wage moderation, is misguided. It is true that Finnish labour costs are higher than Germany’s. But Finland can never become a low-wage-high-productivity-export-led economy like Germany. 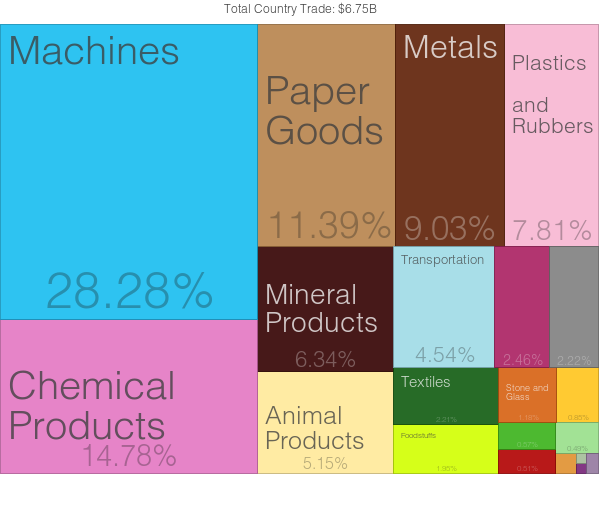 This is an issue which demands another post, but Finland really should focus on the domestic demand and high quality export goods and services (which it does, with examples of KONE or METSO or Pöyry). All in all, the big risk for Finland lies in the combination of a big correction in the housing market prices, a continuing economic crisis with consequences in unemployment and finally as a result of both AND the Ukraine situation a crash in domestic demand. But Finland is certainly no Greece or Spain – the economic fundamentals, innovation and capacity to attract investment seem to be all right. This crisis can be prolonged with the wrong policies (another blast from the past regarding the 1990s crisis and its prelude), and there should be more focus on the issues which are in my view more relevant for the future of the Finnish economy. As I have written somewhere sometime last year, a good start would be for the unions to demand higher wages, before Finnish households become trapped with deflation. Wage moderation may appeal to a moral sense of ‘we all have to suffer’ but it is not exactly good for domestic demand. The disaster with MH17 is terrible. I think the Ukraine-crisis is much worse than people may think. I am just wondering, wouldn’t increasing sanctions and barriers to trade with Russia actually increase the chance of armed conflict? 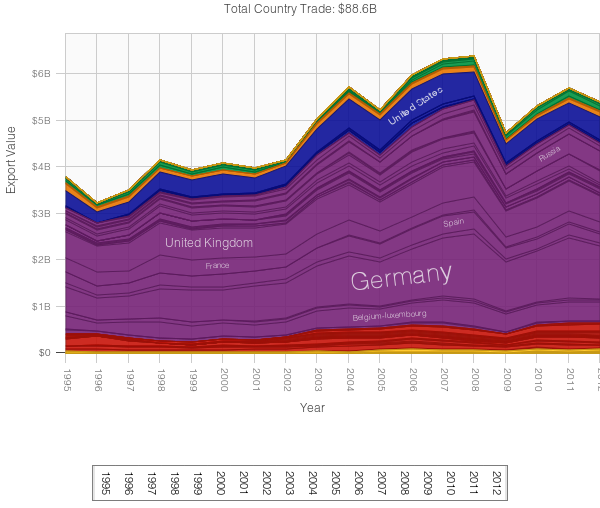 I mean, interconnectedness of trade gives a good reason to important sections of society on either side to prevent conflict. 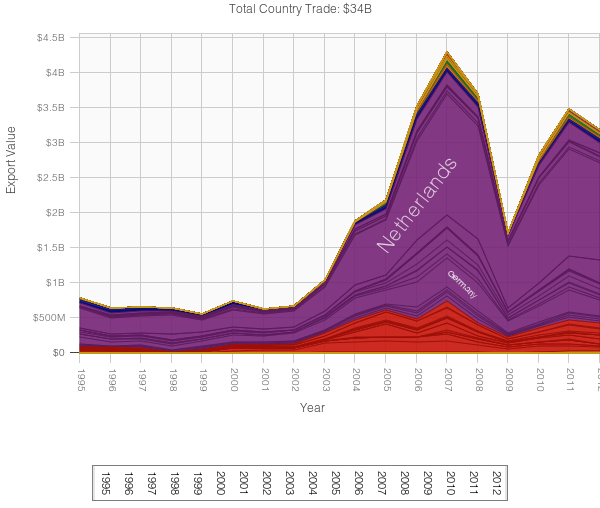 After all, conflict means loss of market access etc. And this was the original solution to the German-Franco rivalry in Europe. Shocking. Truly shocking. This is what you get when a party wants to attract votes from the Golden Dawn Nazi-party voters.